Alright, many of you would find this title a bit controversial. But that is exactly what Linus Torvalds the father of Linux said when asked the simple question of which Linux distribution is his favourite one. 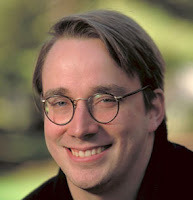 Linus Torvalds was interviewed by oneopensource.it where he went on to express his thoughts on a variety of topics including GPLv3, whether Linux infringes Microsoft patents, about Microsoft - Novell agreement, the future of Linux kernel and so on. The questions posed are quite thoughtful and Linus Torvalds answers are equally interesting. I don’t really tend to care much, I’ve changed distributions over the years, and to me the most important thing tends to be that they are easy to install and upgrade, and allow me to do the only part I really care about - the kernel. So the only major distribution I’ve never used has actually been Debian, exactly because that has traditionally been harder to install. Which sounds kind of strange, since Debian is also considered to be the “hard-core technical” distribution, but that’s literally exactly what I personally do not want in a distro. I’ll take the nice ones with simple installers etc, because to me, that’s the whole and only point of using a distribution in the first place. So I’ve used SuSE, Red Hat, Ubuntu, YDL (I ran my main setup on PowerPC-based machines for a while, and YDL - Yellow Dog Linux - ended up the easiest choice). Right now, most of my machines seem to have Fedora 7 on them, but that’s only a statement of fact, not meant to be that I think it’s necessarily “better” than the other distros.